Feeling pretty blue this week in Illinois, but it's a good thing. This coming weekend (Sat.-Sun., June 13-14) is our first annual Blue Carpet Corridor festival weekend! Our theme is "Miners, Mobsters and the Mother Road" honoring our heritage in this part of the great state of Illinois. After all the months of discussing, planning, getting quotes, designing things, writing things, a gazillion emails and phone calls, and ironing out a few kinks, the event is nearly here. Your BCC Pres. (me) and fellow officers Dave Tucker (VP/Webmaster/Master of Supplies), Suzanne Grey (Secretary), and Jim Wreath (Treasurer) have been pretty busy. If you've been asleep or under a rock during my nine million Facebook posts and numerous blog posts about the BCC, here's the scoop: Unlike an organized motor tour, on BCC weekend you may start at any town, stay as long as you like, and visit as many or as few communities as you wish. Of course you will probably want to visit the Passport Stop in every town! You can pick up your free passport in any of our 18 communities as long as supplies last. And each city or village has its own unique stamp to add to the map inside your souvenir passport! But don't stop with those two festivals! Every community has something for you to do, see, hear, or eat! Children's activities, historic exhibits and tours, live entertainment, flea markets, food vendors! A car wash, a "claim to fame" tent, a model train layout with trains running, a local/regional author fair! I think you'll spot Mr. Lincoln and Elvis and who knows who else! Some communities will have souvenir t-shirts for sale. And much more! 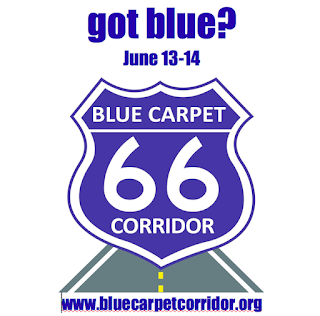 Please go to www.bluecarpetcorridor.org for complete schedules! You can go to the schedule for each town by clicking (on the main home page) on the community name and then choosing the "BCC Events" page for that town. Seriously, there is a ton of information on our website about our communities. So come get blue with us Sat.-Sun.! You won't stay blue for long! Wait, you will stay blue. No, I mean you'll get blue but you won't be blue. Aw, just get on the Blue Carpet Corridor and have a great time!